Vectis Marine Design was established in 2008 as an independent marine consultancy specialising in the design and project management of military and professional small craft. Vectis Marine Design's two principal Naval Architects together have more than 35 years' experience in the marine industry. Prior to establishing Vectis Marine Design, Dr. Andrew Humphries was Design Manager with VT Halmatic for 7 years and John Fox-Robinson was Principal Naval Architect for 6 years. Our team is made up of capable and experienced small craft Naval Architects, Mechanical Engineers and Marine Design Engineers. Our office is equipped with modern hardware and software to enable us to carry out all aspects of marine design and project management. 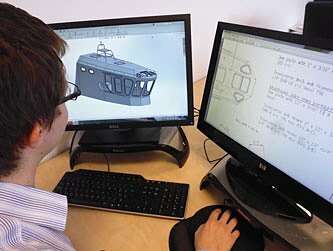 We have proven experience of designing boats for the UK Ministry of Defence (Royal Navy, Royal Marines and Army), and military, coastguard and police units worldwide. We offer an independent and confidential service to clients in the military and professional boat industry. Vectis Marine Design is based near Southampton, on the UK south coast, close to Southampton airport.